About this time last year, I wrote this post, whining about how cold it was in Seoul during the winter. I pointed out that, having come from the American Southwest, where 'winter' involved nothing more than a heavier jacket and - maybe - socks, I was in a state of shock. I whined about how cold it was, how my feet got numb while waiting at the bus stop, and how tired I was of wearing several layers of clothes all the time. I whined about the Cold Siberian Air Mass Thingy that was responsible for Seoul being so uncomfortable in the winter. In short, I made it clear that Winter in Seoul was Awful. As it turns out, last winter was, in fact, a mild one. We had a few episodes of snow and it got down to about freezing, but otherwise, it wasn't too bad, as far as winters in Seoul go. I know this only because this year has turned out to be one of the coldest on record. We had snow in late November - or maybe it was early December (it all runs together in a blur, you see)- and the temperatures have never risen enough for the snow to melt completely. We've had several more significant snowstorms since then. Oh, there have been a few balmy days where the highs hovered slightly above freezing (35F/2C), but for the most part, our daily highs have been in single digits (Fahrenheit) or the negative teens (Celsius.) What this means is that the existing snow will begin to melt into a cold, wet slush for a few hours during the day and then freeze back up as soon as the sun goes down at 5:30 or so, providing fun and games on the ice when you (meaning 'I') head out to work the next morning. In short: it's really unpleasant. Especially when one depends on public transportation to get around town most of the time. Probably the best way to sum up my experience with the cold this winter, though, would be a quick glance at the evolution of my footwear as the winter has progressed. These kept my feet dry and sort of warm on the way to and from work, which was what interested me, and they worked fairly well through the beginning of December. The Uggs were effective at keeping my toes from freezing, but Ugg soles don't provide much traction, and our trek up Namsan in the ice and snow on New Year's Morning made me realize that I probably also needed something a little stouter to add to my wardrobe: waterproof, warm, and with a sole that would allow me to navigate deadly ice patches on Seoul's many hilly sidewalks with the sure confidence of a mountain goat. It may yet come to that. Spring's still a long way away. NICE!!! 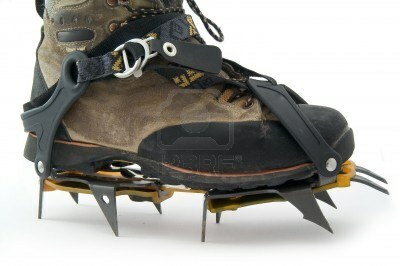 I wanna walk around with bad spikes!! Traci - I have seen several people wearing them - yes, in the city. I suspect that I will probably end up hurting myself - or someone else - with them. OMG, poor you! Husband has a set of crampons in the cupboard that he's used, oh, twice, along with all the other expensive adventure sport gear he owns. Perhaps I should post them to you? Yeah, it's a cold one, and I've been here 9 years. Weirdly, you & I have the exact same black Clarks booties, how's that for a coincidence. They're a little slippery on the ice. I try not to be outdoors much, so I haven't graduated to anything sturdier. Stay warm! Oh that must be so miserable. I don't like the cold at all. This winter has been mild so far - we are having day temperatures of 9 or 10 degrees Celsius, positively balmy. Mustn't speak too soon though. I have some gorgeous sturdy Timberland boots and I want to wear them but it's not cold enough. Ever since I bought them the weather has stayed warm. Typical. I don't do serious cold too well so I am impressed that you are managing at all! Really like the last boots too. I am a bit of a sucker for hiking boots and those are seriously stylish to my eyes! CP - How funny! They were great back in November, weren't they? I found them too cold and too slippy on the ice on the way to work, hence the Uggs. Elizabeth - Thank you! I'd never heard of the brand ('Zamberlan') before, but I wanted Gore-tex and the saleswoman assured me they were good for serious winter trekking. Don't know how 'serious' my winter trekking will get, but they're working well on the hill up to work so far! MTFF - Such a kind thought, but as I told Traci, I'm pretty sure I'd hurt myself. I'd be bound to forget I had them on and try to cross my legs or something. Would probably make for an entertaining blog post, though. Emma - Not sure yet if I've experienced 'eyelash freeze' - but it wouldn't surprise me! 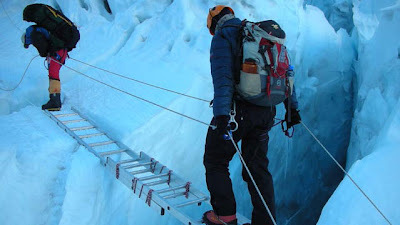 Yes, 'ice grabbers' (or whatever they say in Korean - no idea) are a cheap, safe, and popular concept - I've seen quite a few people wearing them, although not quite the dramatic mountaineering version I posted on the blog! Its not my first time to go to see this web site, i am browsing this site dailly and obtain good facts from here all the time. I understand needing good warm boots. After Christmas we went boot shopping. Uggs had a -waterproof -30C pair but like you said there is no traction. Ended up with some zip up -30C boots. They are perfect for sledding and walking at the dog park. Great traction. More like a mukluks than a hiking boot. Not pretty but so far, I've had dry and warm tootsies. I'm traveling to Seoul next week and I don't want to bring my bulky Sorel snow boots. I'm thinking of buying a new pair that are insulated with 3M's thinsulate. Would that be sufficient for the cold weather? I apologize. I kept pressing back to go back to the main blog and ended up spamming your comments page. I can't give you a 100% definitive answer about the boots,since I don't have any with thinsulate myself, but I think anything insulated would be just fine with a good warm pair of socks. I've worn my Uggs most days (now that the ice has melted)and probably could have worn something even thinner. We've had temps around 1-3 (Celsius= low 30sF) in the last few days and expect mostly the same for the week, so most of the snow and ice on the sidewalks has melted, and those brutally low temps seem to be out of the picture for the time being. If you'll just be walking around the city and not taking any lengthy hikes or standing for long periods in the snow, you should be perfectly fine. For that matter, if you are tougher than I am, you could probably get by with even less. I'm always amazed by the number of women I see on the bus and subway wearing pumps. I have no idea how they stand the cold, much less how they navigate around the ice! You can also easily find Ugg-type 'knock-offs' all over the place in the subways/market stalls for anywhere from KRW10,000-20,000(as long as you don't wear anything bigger than a US size 8 or so!) Hope this helps a little and enjoy Seoul! Thank you! I usually trek around sockless in my pumps in Toronto weather. But I went out and bought a pair of insulated boots. Ah - so winter in Seoul is rather like winter in New England? Ouch! I'll be in Seoul during the Seollal weekend and I'm already quaking in my boots at the thought of braving such chilly weather. Cheerio, and I pray that spring arrives sooner rather than later! Thanks for the post! I'm from So Cal, so I'm out of my depth when it comes to cold weather, but I'm moving to Korea in February. I wear an 8 but I have wide feet. Should I buy snow boots before I leave the US or will I be able to find boots after I arrive? You can find size 8 in places, but it depends on where you live (easier if you're in Seoul or an area that caters to Westerners). I didn't have any trouble buying insulated cold-weather hiking boots in a 7.5 at a shop in Seoul, but they only had them in one style. It depends on the store and the style of shoe and other factors, but if you have a wide foot, you might be better off shopping before you move. If you can get a pair before you leave, I would recommend it just to save yourself some time from going from place to place. In addition, it's very likely there will be snow and ice on the ground already when you arrive. No fun to land and immediately have to go shopping for necessities!